Philosophy, a word possibly coined by the ancient Greek philosopher Pythagoras (570-495 BCE), means “love of wisdom”, but Pythagoras did not argue that his ancient Greek people invented either love or wisdom. Wisdom, like freedom, is difficult to define, but when people of different cultures are asked who is wise, they tend to say that they see beyond the here and now, taking the long view and the social view. Life is hard because we must balance our interests and perspectives with others. Wise individuals are not simply smart, but have the ability to change perspectives, to see the bigger picture, and to reason with others and themselves. While wisdom does not necessarily come with age, older folks who have been kicked by life but keep their minds and hearts open are often called wise as they have a wider perspective of human life. Imagine humanity was completely exclusive, not a kind of reptile that eats its young with no thought of their interests (#notallreptiles), but a mammal that recognizes the interests of others and works completely against them to ensure its own interests. As individuals, we would still eat, but we would try to stop anyone else from eating, as food is limited. We would still mate, but we would try to stop anyone else from mating, as mates are limited. We wouldn’t necessarily say things or send signals to others about our interests, but if we did we would try to stop anyone else from saying anything, as power, time and the attention of others are limited. We would not be able to share as we have for thousands of years in countless cultures to discover, create and collaborate. It would be difficult, if not impossible, to grow and widen our perspectives through interaction and dialog. Now imagine humanity was completely inclusive, not a kind of insect that gives no thought to individuality beyond the hive mind, but a mammal that recognizes the interests of others and works in the interests of others regardless of how it conflicts with one’s interests. We would feed random strangers the food we have even if our children were starving, as their interests are equal to ours and our children’s. We would dialog with others, and no matter how their views and interests conflict with our own or threaten our lives, we would not exclude them from the group or their views from what we imagine to be the truth. Humanity, including each of us, is both exclusive and inclusive, as well as exclusive to be inclusive and inclusive to be exclusive, in ways that become more and more complicated along with culture and technology. In Daniel Everett’s groundbreaking book Don’t Sleep, There Are Snakes (2008), he says that the isolated Piraha tribe of the Amazon Jungle have no technology other than bows, arrows and temporary huts, without fixed traditions of basket weaving or artistic designs. They have words for more and less, but don’t have words for one or two and thus do not have conceptions of numbers. This is similar to the Russian peasants who psychologists tried teaching arithmetic, who were utterly confused by the idea of numbers in themselves that are not particular collections of physical objects. The Piraha do not distinguish the past from the future, but speak of both as other-than-now, and thus do not have an oral history or even a creation myth. For the Piraha, life has always been the way it is, without beginning or end, they are “straight-headed” and everyone else with different ways, including other Amazonian tribes, the Brazilian army and inquisitive anthropologists, are all “crooked”. Younger Piraha who leave to live in Brazilian cities grow into fully competent Moderns, as the French anthropologist LaTour calls our own tribe. Some do join other tribes, such as our Modern society, but most stay with the Piraha’s familiar “straight-headed” ways. Just as the Cheshire Cat tells Alice in the middle of Wonderland, because our ways and interests are opposed to others they are insane and backwards to us and we are insane and backwards to them. The Buddhist teacher Thich Nanh Hanh says we are all insane, and few of us work our way towards sanity. The human mind understands by splitting things into opposites such as good and bad, true and false, order and chaos, control and freedom, and many other pairs to make sense of the infinite complexity that surrounds us. One of these basic pairs is belief and doubt, answering and questioning, saying yes and saying no to tribes and traditions. The German philosopher Hegel (1770-1831) says us that our minds have two sides that work together and oppose each other called understanding and reason. Understanding holds beliefs and answers set and steady, while reason doubts and questions, rearranging and challenging our understandings when they do not work or do not apply. Knowledge is a set of understandings and answers that works well enough in a given situation, while wisdom is the ability to reason and question, to see beyond set understandings and perspectives. Cultures and systems of human thought use understanding and reason to produce knowledge and wisdom. Philosophy has been called thinking about thinking itself, the doubting, questioning and investigating of all traditions, answers and forms of authority. Some have said that the ancient Greeks invented both science and philosophy, the self-conscious pursuit of fixed understanding and free reasoning. As mentioned with Pythagoras, the ancient Greeks did not say this of themselves, and most great Greek thinkers, such as Heraclitus, Socrates, Plato and Aristotle did not think highly of their fellow Greeks. Heraclitus, my favorite Greek thinker, said that all the adults of his city Ephesus should hang themselves and leave the city in the abler hands of children. Plato and Aristotle hated Athenian democracy, possibly because the most famous or infamous act of the Athenian assembly was condemning Socrates to death for questioning everyone about everything. In Paul Radin’s book Primitive Man as Philosopher, he argues that all societies, including American and African tribes, have a small number of individuals who are radical questioners and pioneers in innovation and individual thought. Perhaps the Piraha are so conservative in their ways that innovators seek culture elsewhere. 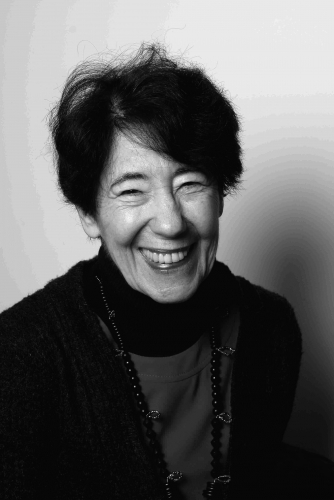 In Miguel Leon-Portilla’s book Aztec Thought and Culture, he argues that the Mayan and Aztec poets questioned their societies and systems of knowledge, asking open ended questions such as “Do we know the gods exist?”, “Is there an afterlife, like the ancestors said there is?”, and “Can anyone speak true words? If they can’t, these words aren’t true”. One imagines that their priests, much like the Athenian assembly, longed for these philosophical poets to quit their questioning. 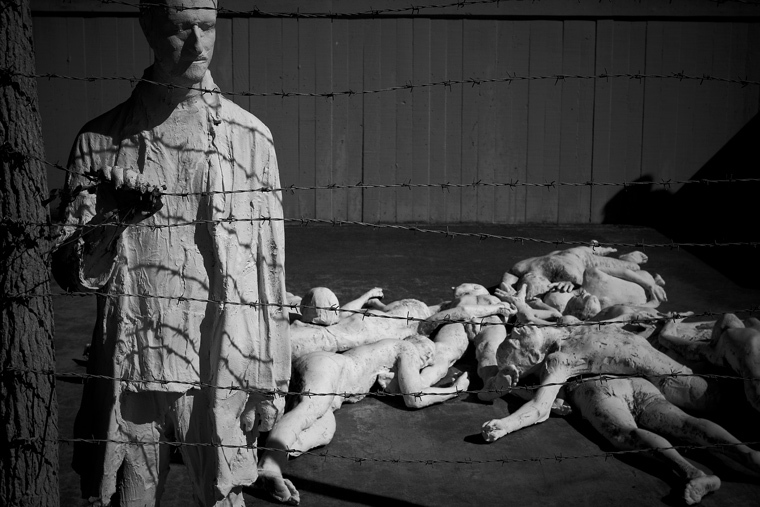 When we look at ancient and modern cultures, we find that people encourage and discourage questioning of the forms of authority and the powers that be, what Marcuse and the Frankfurt School called the Establishment in the 60s. No society would survive without pushing in both directions. In much the same way, walking requires planting your feet and moving them to take each step forward. 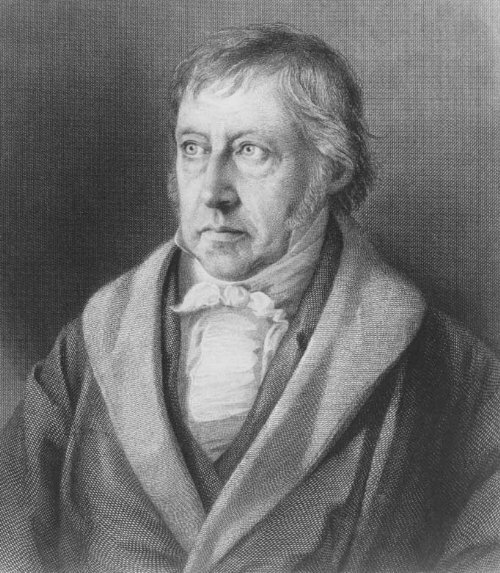 Hegel, who influenced the Frankfurt School and many others, argued that the history of human thought is a battle between dogmatism and skepticism. As a boy, Hegel watched the French Revolution from afar in Germany, and he saw the French revolutionaries split into two camps, with the conservatives sitting in the right wing and the progressives sitting in the left. This is where we get these political terms. In politics, conservatives lean towards believing and affirming traditional forms of authority and institutions, often looking to the stability of the past, while progressives lean towards doubting and questioning the institution, often looking to the openness of the future. In philosophy and systems of thought, dogmatists lean towards fixed understandings (“There are certain facts, morals and truths.”) while skeptics lean towards continuous questioning (“Are there certain facts, morals and truths?”). When we are dogmatic, we would rather defend answers than ask challenging questions, and when we are skeptical, we would rather challenge than defend. This battle is also a symbiotic evolution requiring both sides. Without a base that is assumed, nothing new can be produced. 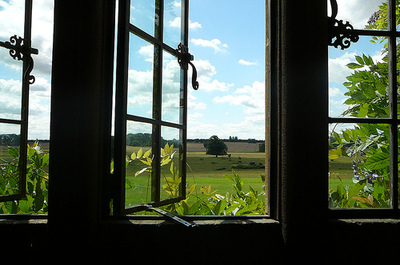 However, without reaching for the new and questioning the old there is no growth to improve and fit new circumstances. Great thinkers in all cultures incorporate the old while bringing us the new. Often they are called heretics in their time and only canonized after they are safely dead because they have to question the very system that they stand for. David Hume, a very skeptical philosopher from Scotland, wrote that everyone would be skeptical and philosophical if they could, but unfortunately we each need to eat, and thus must get a job, and thus cannot question everything. Thankfully, this creates the unique position for the philosopher, who can make a living showing everyone that they have been concerned with making a living and not asking questions about how to live a better life. Many unfortunately believe that philosophy was born in ancient Greece, when in fact wisdom is universal to human kind even though it is difficult to achieve. The wise, though rarer than we would like, have been celebrated in all cultures, and their wisdom is similar across all cultures even though their beliefs can differ widely. While the word philosophy is an ancient Greek word, possibly invented by Pythagoras, great thinkers and questioners can be called philosophers and sages in all cultures. As we shall see, the medieval and modern Europeans identified with the ancient Greeks because the Greeks were a central source of the European Christian tradition. If Egypt, like Greece, had become a Christian rather than a Muslim land, Europeans might have claimed that the Egyptians were their ancient ancestors who invented reason, philosophy and science, a claim made by Plato, the most famous philosopher of ancient Athens next to his supposed teacher Socrates. This class focuses on modern European philosophy, the thought of European philosophers since 1600 CE up until the present day. 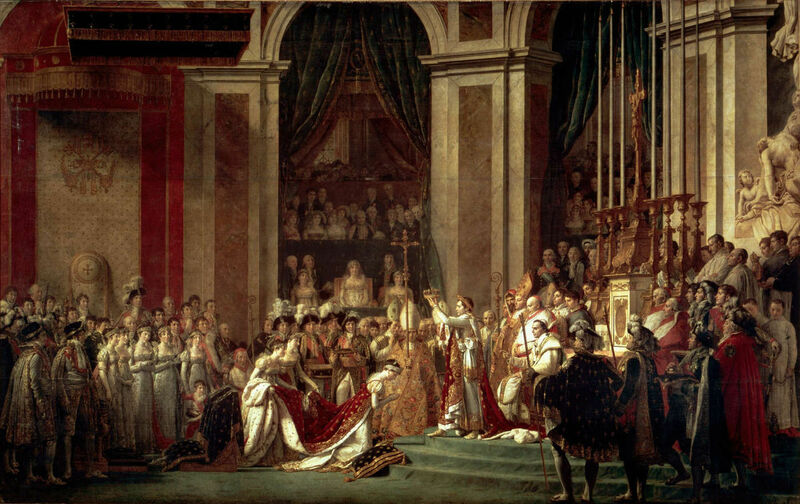 Before we given an overview of this period, paying particular attention to the split in the late 1800s between the Analytic and Continental traditions, we will consider the often ignored golden ages of the world that occurred before the European Enlightenment of the 1600s. Before the European golden ages of the Renaissance of the 1400s and Enlightenment of the 1600s, many technological, medical and mathematical advancements were made in two previous golden ages, those of China and Islam. 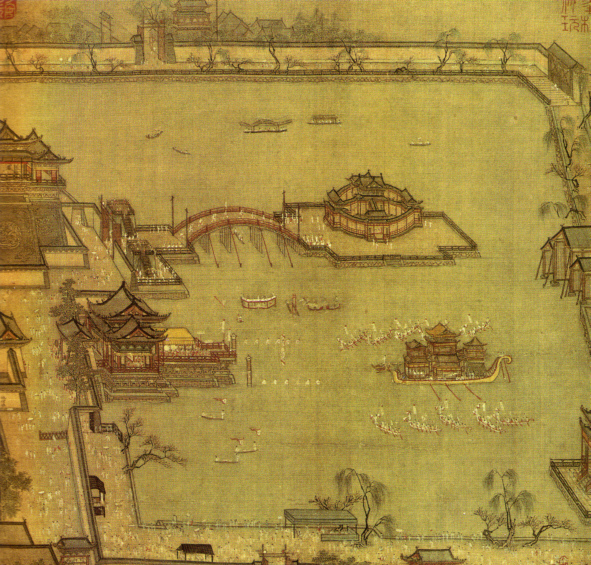 During the Tang and Song Dynasties of China, between 600 and 1200 CE, many of the basic machines and techniques were developed that would continue to serve as the base of later golden ages in Islamic and Christian lands. 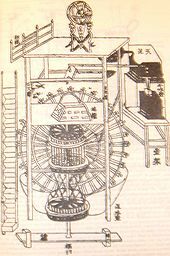 The Four Great Inventions, as they are known in Chinese and European scholarship, are paper, printing, the magnetic compass, and gunpowder. In 1620, the famed European scientist Sir Francis Bacon wrote that three of these, gunpowder, the magnetic compass and printing, were the most significant advancements of humankind in all of history, separating ancient and modern times. He was unaware that all three were Chinese, originating in the Tang and Song Dynasties. In this sense, Chinese mechanics and their later evolution separates modern European culture, as well as our shared global culture, from the ancient cultures of Greece, Rome, Egypt and Persia. Much later in the 1800s, Karl Marx wrote that these same three inventions brought about capitalism and the bourgeoisie, the middle class that is needed to regulate the poor in the interests of the rich. Scholars in Communist China agree with Marx’s theory, while noting that these Great Four were merely the most significant inventions that passed from East to West, not the most sophisticated innovations of the Tang and Song. Gunpowder was invented by Daoist alchemists, who sometimes blew themselves up in caves as they searched for elixirs of immortality. This is similar to Isaac Newton, who devoted much of his time to alchemy and the transmutation of lead into gold, remembered instead for his theory of gravity. 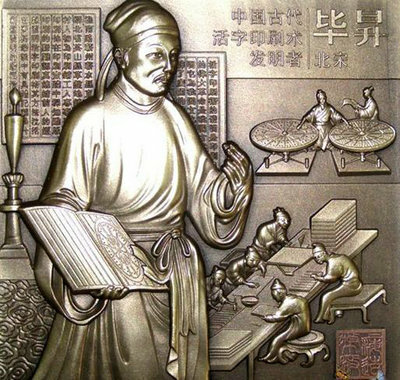 While Islamic and European alchemists sought to transmute lead into gold, the primary purpose of Chinese alchemy was transmutation of the body and mind. While alchemy is now discredited, it was not a useless venture. As with most discarded models and pursuits, much is discovered as a byproduct before problems become significant enough to require a paradigm shift, a term coined by Thomas Kuhn, a philosopher of science we will cover in this course. Paper took many forms, such as wall paper, toilet paper (which was originally only for the rich), and tea bags. With paper and block printing came paper currency, which we still use today. Block printing, using movable and set type of wood or metal, was used also for textiles and playing cards. Materials such as paper, wood and metal were made fireproof and waterproof with lacquers. 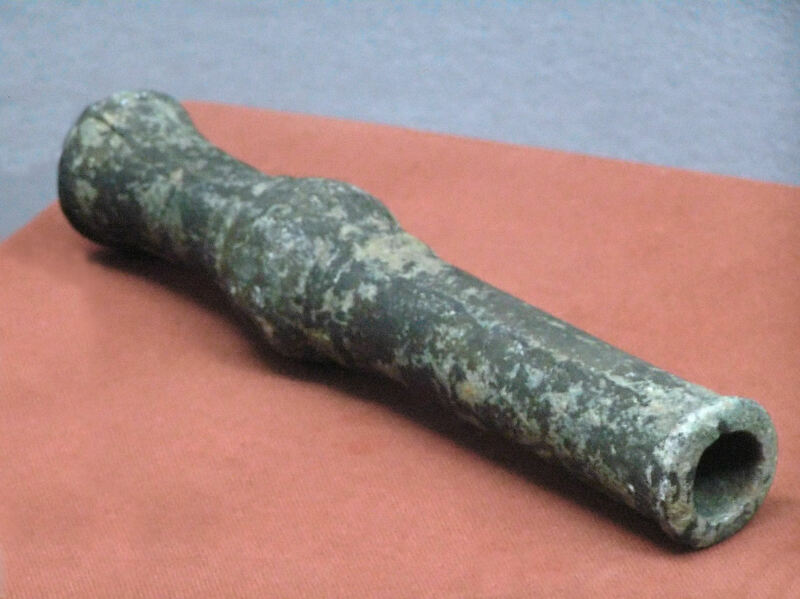 In addition to these inventions, there were many other Chinese mechanical innovations that had a profound significance on life and engineering. Cast iron, developed in China, made its way to medieval European blacksmiths. Many of the basic components of mechanics, such as gear systems, the belt drive, the chain drive, and the spring allowed for the development of countless devices useful in all aspects of life, as they still do today. The spinning wheel, waterwheel, the windmill and the mechanical clock all passed from China into Islamic lands, and from there into Europe forming the basis of mechanical advancements of Leonardo da Vinci and other innovators of the Italian Renaissance. Automata, mechanical people primarily used for entertainment, followed this same route, such as the figures that dance attached to clocks which first entertained sultans before delighting the German public and much later Disneyland tourists in clock towers. 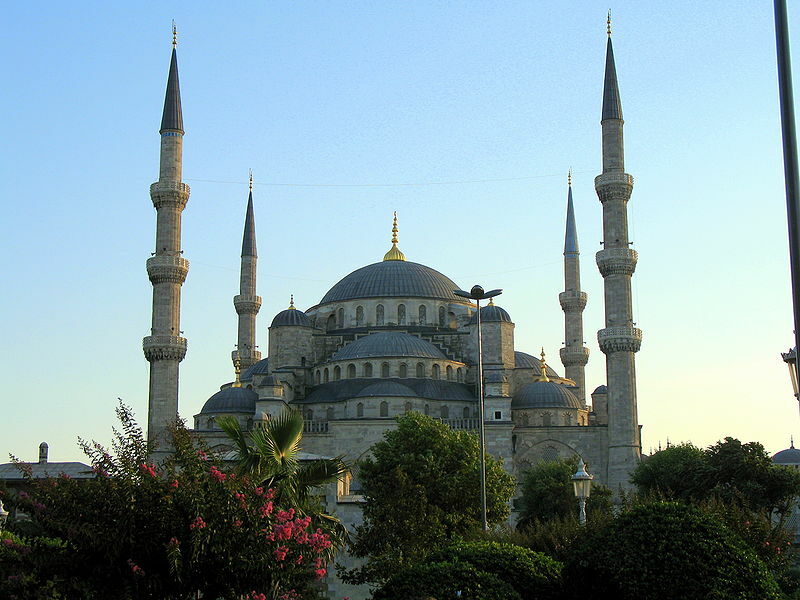 During the Islamic Golden Age, between roughly 700 and 1400 CE, innovations from China and India were incorporated and further developed. Most significant of these was the development of algebra by Islamic mathematicians out of earlier Indian mathematics, which included the Indian-Arabic numerals we still use today as well as the concepts of zero and the resolvable variable. Algebra led to Calculus in Europe, invented by both Newton and Leibniz, one of the European philosophers we will cover next week. We still use Leibniz’s notation in Calculus today because Newton tried to name everything after himself, a plan that did not prove popular. 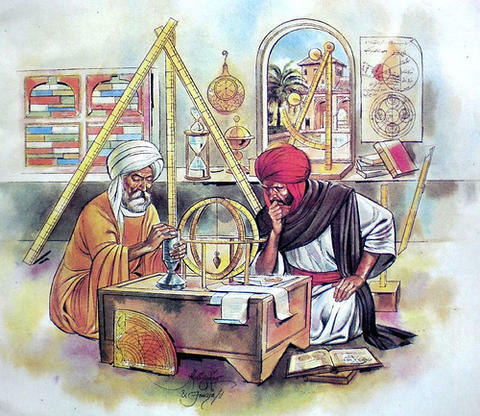 Several of the great philosophers of the Islamic Golden Age were also scientists, doctors, logicians and mathematicians. 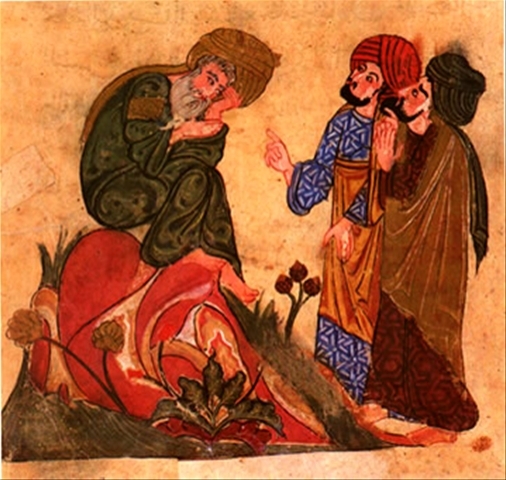 Avicenna or Ibn Sina (980-1037) was the foremost doctor of his time. As a boy he learned Indian Arithmetic from an Indian grocer in his neighborhood. His Canon of Medicine was used as a textbook for Europe in translation until the 1700s. 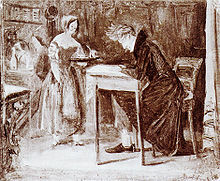 His medicine was based on experimentation and clinical trials, fusing Persian, Greek, Indian and other texts together. He is credited with formulating the nature of infectious disease, hypothesizing that microscopic organisms are the cause, randomized control trials, major concepts of psychiatry including hallucinations, insomnia, mania, dementia, and epilepsy. He was the first to correctly show the workings of the eye, arguing that light comes into the eye rather than emanates out of it, otherwise we would be able to see in the dark. He was one of the key authors for understanding Aristotle and scientific investigation, even as he argued against Aristotle. Avicenna’s floating man thought experiment should be important for a modern European philosophy class because it is strikingly similar to Descartes’ deceiving demon, one of the first major concepts of modern European philosophy. Avicenna, who worked with anesthetics in publicly funded hospitals, asks us to imagine that we are slowly unable to feel our feet, then body, then sight and sensation, then memory and imagination. What is left, the last and most essential thing that is ourselves? Avicenna replies that it is consciousness. With that, we still can be said to exist, aware even if we cannot be self-aware by imagining or conceiving of ourselves as a concept. 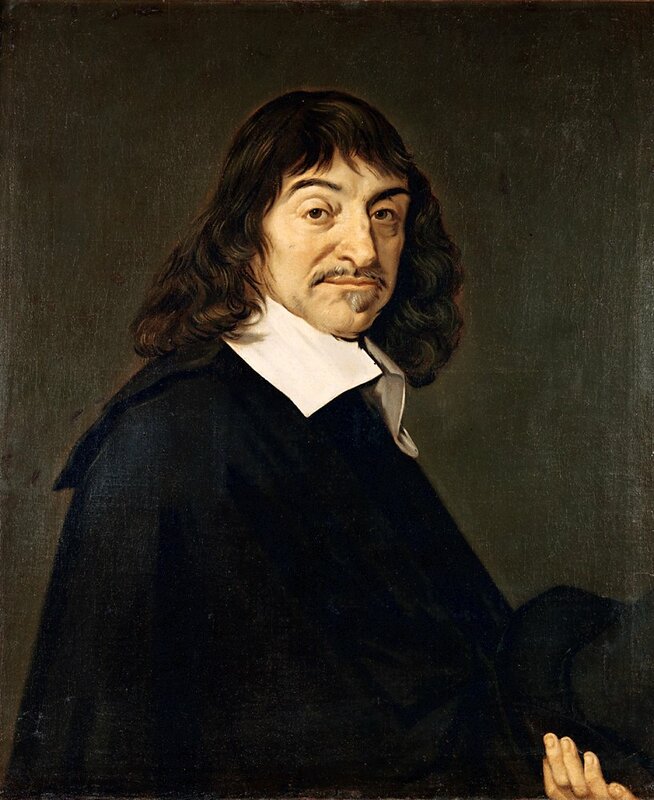 Descartes, who we will study next week, has us imagine that there is a demon who is deceiving us and creating the world as an illusion, but the one thing the demon can not trick us about is that we are. Descartes concludes with his famous, “I think, therefore I am”, just as Avicenna concluded that we are because we are conscious. 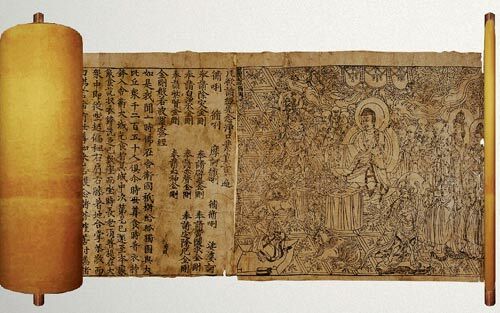 Clearly in China and the Middle East life had become more complex, with increasingly sophisticated technology and with this a relatively greater understanding of the human body and mind. Between 1400 and 1700 CE, as the golden ages of China and Islam drew to a close, Europe surpassed previous cultures in wealth through trade and power through technology. 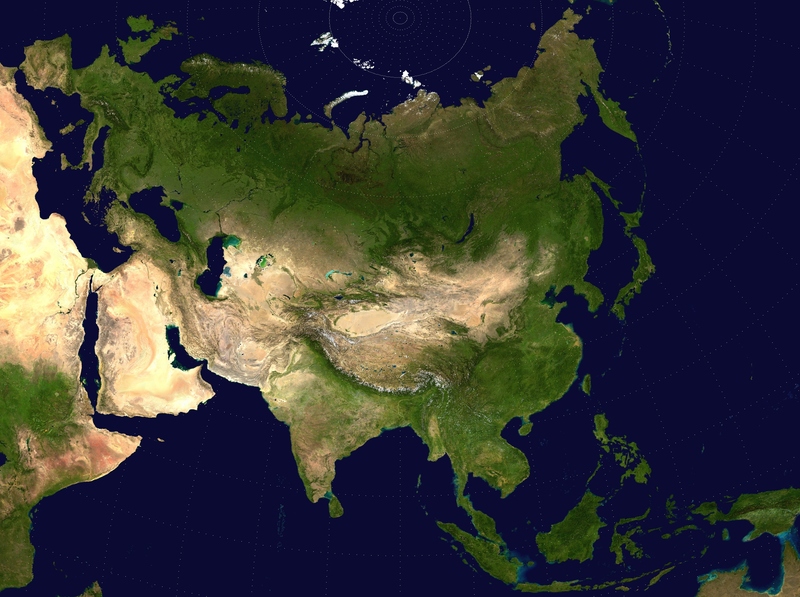 By 1700, more gold and silver were passing West rather than East along the Silk Road for the first time in history. 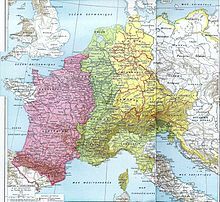 While this was originally referred to as Christendom, and then later “the European race”, including the ancient Greeks and Romans in an ethnic group they would have wanted no part of, it is now referred to as “the West“, particularly after the Holocaust made any mention of “the European race” unpleasant. Unfortunately, this arrogant distinction was not itself reasonable, and certainly not wise. Modern European philosophy started as a single tradition but then split into two separate branches in the 1800s, the Continental tradition of Germany and France (also Italy, Spain and Russia) and the Analytic tradition of Britain and America (also Canada, Australia and South Africa, the English speaking countries of the former British Empire). The first several European philosophers we will study, those between and including Descartes and Kant, are shared by both traditions. Modern European philosophy taught at American universities typically covers Descartes, Spinoza, Leibniz, Locke, Berkeley and Kant with few additions. 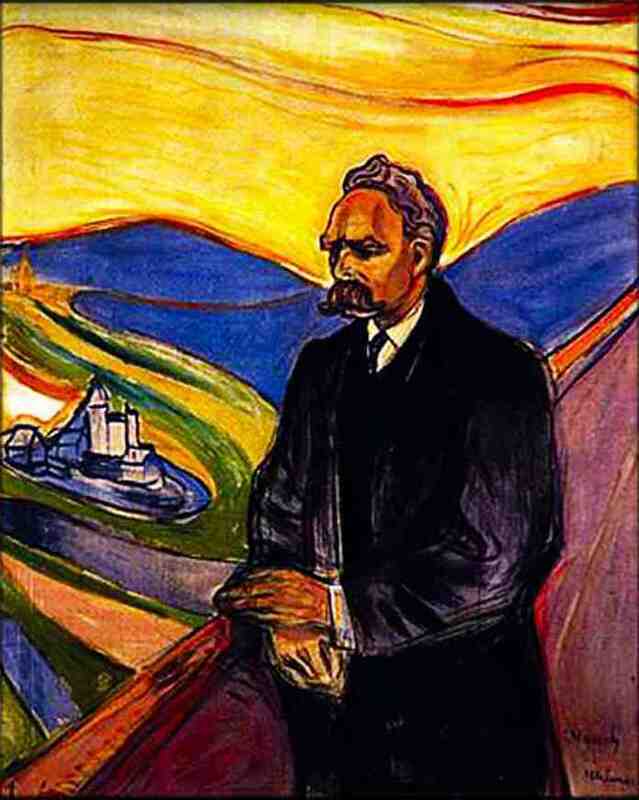 While courses in Hegel, Nietzsche and Heidegger are offered as electives, the core classes focusing on mind, language, logic and ethics are taught from an Analytic perspective primarily using works by American Analytic philosophers. The Analytic tradition continues after Kant to study the first Analytic philosophers: Frege from Germany, Russell from Britain, and Wittgenstein from Austria. After the initial German and Austrian, most Analytic philosophy comes from the English speaking countries of Britain and America. 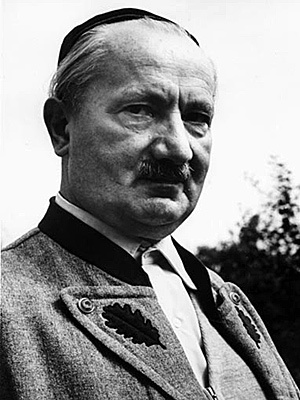 The Continental tradition largely consists of German and French thought, and continues after Kant to study the German philosophers Hegel, Nietzsche, Heidegger, and then several French philosophers influenced by these earlier Germans. Why the split between the two camps? Two strands of thought went in opposite directions from Germany, the Continental tradition embracing Hegel, the Analytic tradition rejecting him and Continental thinkers influenced by him. There are both political and philosophical reasons for this. While Hegel became a conservative in later life, his thinking spelled out the path of radical change and revolution. As mentioned, Hegel saw history as a battle between right and left, between understanding and reason, and between dogmatism and skepticism, a major influence on Karl Marx, coauthor of the Communist Manifesto and the founding philosopher of Communism and Marxism. Marx argued that society was in need of radical revolution and change, and that just as the French Revolution had removed the aristocrats and clergy from power, a communist revolution would remove the capitalists from the top of society such that everything is democratically shared by the people. Britain and America, the wealthiest lands on the planet, were somewhat uncomfortable teaching Hegel and Marx, who were both studied centrally in communist countries. Several scholars have noted that it was only with the fall of the USSR in 1991 that Americans began to study Hegel as they had before the Cold War. It has been said that Continental philosophy wants to be an art, while Analytic philosophy wants to be a science. German and French thought likes the profound and dramatic, British and American thought likes the dry and tidy. Too often, this means that Continental thought is confusing and difficult, but deep and meaningful, whereas Analytic thought is clear and precise, but shallow and uninspiring. Let us first look at the Analytic and then the Continental tradition to further understand this difference. The term ‘Analytic’ was first used by American philosophy professors in the 1930s, and then increasingly by Americans and British professors after WWII to distinguish themselves from the Germans and French who followed Hegel. Analytic philosophy focuses on logic and language, prioritizing the objective and impersonal. 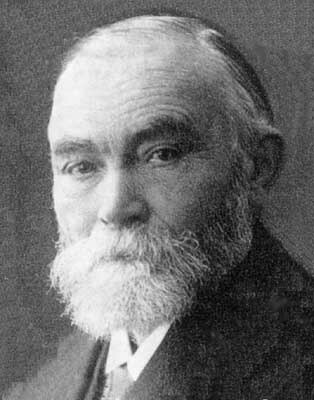 Frege revolutionized logic, using mathematical structures to describe logical reasoning. Russell, who saw in Frege’s logic a method for clarifying and solving philosophical problems, argued that the unclear and unnecessary can be stripped away, revealing the clear and objective truth, much as math strips away the qualities of things to analyze them in terms of pure quantity. Russell followed Kant, the last link between the two traditions, who wanted to legitimize philosophy as a distinct natural science using logic such that the subjective could be stripped away and the objective truth established. Unlike Hegel, who argued that subjectivity and objectivity are two sides of the same coin, Russell maintained Kant’s exclusive distinction between objectivity and subjectivity. For Russell and the Analytic philosophers who followed him, mixing subjectivity and objectivity confuses things that should be kept distinct. Writing against Hegelians by name, Russell identified two schools of philosophy, ‘Continental’ and ‘British’. While Hegel argued that reality is an evolving historical situation of oppositional perspectives and contradictions, Russell argued that mathematics and science work through eliminating contradictions to discard the subjective and historical leaving only the objective and universal, and that philosophy should do the same. 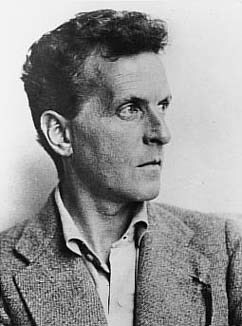 Wittgenstein followed Russell in his early period, inventing the truth table method we use today in logic, though in his later work Wittgenstein distanced himself from Russell and believed that objective truth “in the world” and subjective truth “in the head” could not be exclusively divided. 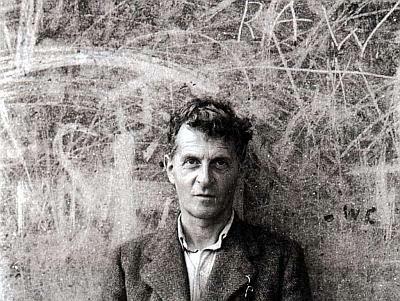 Logical Positivists such as the Vienna Circle picked up and developed Wittgenstein’s earlier work, hoping that philosophical problems would disappear if logically analyzed. This continues to be the dominant position of British and American Analytic thought today, known as Positivism, though British Utilitarianism and American Pragmatism survive in the wings as offshoots that still value science and its methods but are skeptical of claims to absolute distinctions and objective truth. Both argue that concepts and descriptions are true insofar as they are useful and practical, and that there is no objective or exclusive truth beyond this. “Continental” thinkers have only recently taken up the term to distinguish themselves from the Analytic camp, whom they don’t often admire. In America, there was a surge of interest in Continental thought in the political upheaval of the 1960s, and courses on Phenomenology, Existentialism, Structuralism, Post-Structuralism, and Postmodernism became popular amongst some professors and students. We will be studying each of these along with Positivism and Pragmatism in the second half of the course. 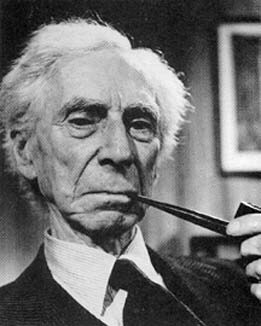 While Analytic thought, like Russell, sought to strip away the subjective and historical, revealing the objective and universal, Continental thought focused on the union of the perspective and personal together with the social and historical. 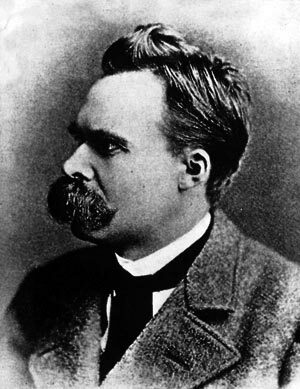 Kierkegaard and Nietzsche, the two forerunners of Existentialism, argued that philosophy was always a personal confession, an experience of personal struggle. They agreed with Hegel that reality is composed of perspectives that are in agreement and disagreement, but they rejected Hegel’s claim to have revealed the objective and total unity of the full set of subjective perspectives, arguing that it is valuable to pursue truth but that claims to total objectivity are naive and foolish. 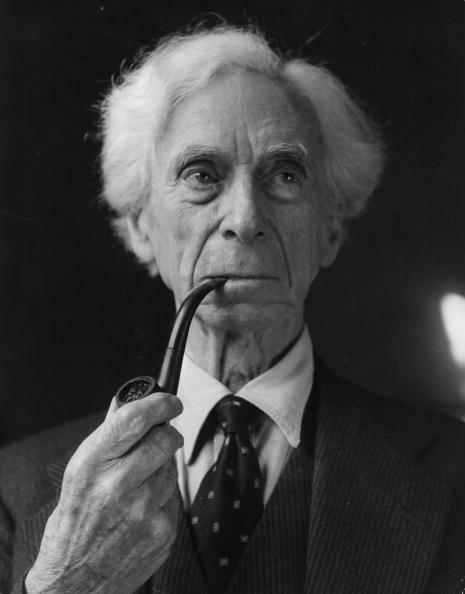 Rather than strip away the subjective as Russell advocated, or claim to have built objectivity out of the sum of subjectivities as Hegel had, Existentialists argued that the problem of subjectivity and objectivity was always open ended, never resolved, and that it was therefore the responsibility of individuals to discover truth for themselves. If individual, social and historical context is stripped away in the interests of simplicity and mathematical precision, the complex meaning of the problem likewise disappears, which does little to solve the problem as we live it. Philosophy should thus be meaningful like art, which has no simple answer, rather than attempt to legitimate itself as a science by focusing on accuracy and exclusion. Which is stronger or more accurate, describing things simply, or complexly? 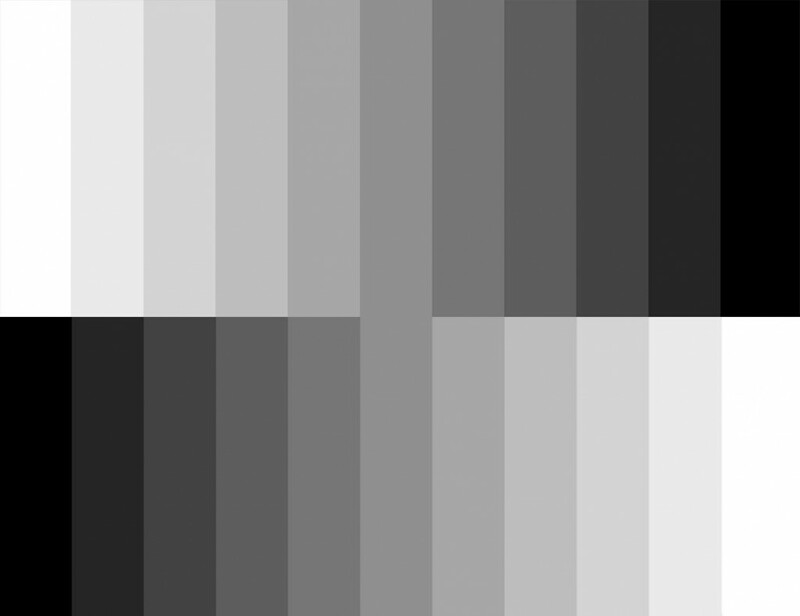 Should we try for the clarity of black and white, or the complexity of shades of grey? If you want certainty and exclusivity, when there will be terrible consequences unless barriers are held in place, simple, absolute black and white is best. If you want complexity and inclusivity, when experimentation and alternatives are safe and permissible, complex, relative shades of grey is best. Should philosophy close more than it opens, or open more than it closes? On the Analytic side, reason should bring us to secure understandings, such that we have a foundational basis for making important decisions. 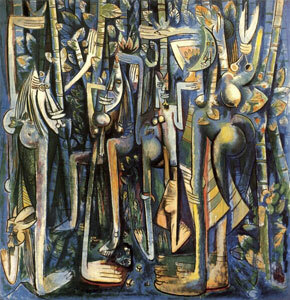 On the Continental side, much of what is most important to us, such as social struggle or our attitude towards death, are murky and not exclusively black and white, which is what makes them so dynamic, dramatic, emotional, and meaningful. Clarity can be relative. Ambiguity and plurality are as much our reality as clarity and singularity. There is a balance to be struck between clarity and depth. Analytic philosophy has been accused of being socially impotent. Removing the situation and saying meaning is static and universal does not allow for social difference and change. Hence, feminists and critics of racism often turn to Continental thought. Questions of social identity, repression, ideology all are declared “meaningless” by the Analytical positivists, even though many people, particularly intellectuals, find these quite meaningful. 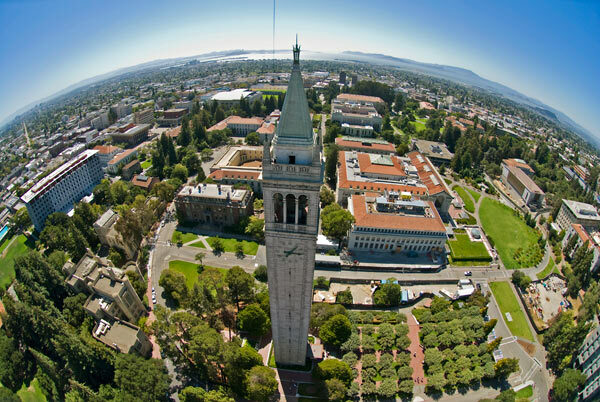 Thus, at UC Berkeley, Continental thought thrives in the English and Rhetoric departments, particularly the latest French thought of Barthes, Foucault, Deleuze and Derrida, while these are almost invisible in the Philosophy department. This is why Judith Butler, the most famous philosopher in Berkeley and leading feminist theorist, teaches in the Rhetoric department and not in the philosophy department. Given the divide between the two traditions, what should we do as we study the history of thought? Rather than swear cultural allegiance to any particular side, we should each examine every side that we can and freely develop our own thinking as we like. Philosophy is an exercise, a training of the mind. Whether or not we close out answers or open up questions, we are training ourselves to think creatively and critically. This is why we study a great range of thought, with all of its disagreements and oppositions, as we learn just as much from a philosophy to which we are opposed as we do to a philosophy with which we agree.